Surveyor-Model was a dummy mass onbaord of Centaur AC-4, launched on 11 December 1964, which was to test the closed loop Honeywell guidance system and perform the first restart of cryogenic RL10A-3 engines in space. The payload consisted of a simple 952 kg mass representative for the Surveyor lunar probe. 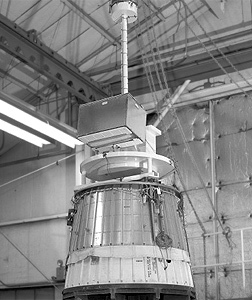 The cylindrical mass was permanently connected to the upper stage. The Centaur stage performed a successful first burn to put itself into a 165 × 178 km × 30.7° parking orbit. After a 25 minute coast the upper stage's engines failed to restart, preventing it from reaching its planned 160 × 8000 km final orbit. The Centaur's four hydrogen peroxide ullage rockets were downsized from the successful AC-2 design in order to save weight, but the new thrusters provided insufficient thrust to settle propellants during the coast period. As a result, LH2 venting put Centaur into a tumble-roll, uncovering the propellant inlets. Since NASA listed the RL10A-3 restart as a secondary objective, and since the guidance system test was successful, the mission was, inspite of the low orbit, reported to be a success at the time. 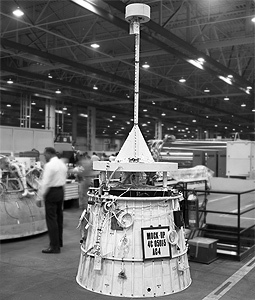 The Surveyor-Model with the attached Centaur stage reentered after one day on 12 December 1964. The second one was successfully launched. The third was launched after the first two real Surveyors were launched to test a new three burn profile of the Centaur upper stage.